Set to make its inaugural (and final) flight in Miami, Sweetwater’s “Flugtrout” is a giant flying fish made of aluminum, polystyrene, plywood and Tyvek wrap, and will set sail at the annual Flugtag flying competition this Saturday, September 21, in Bayfront Park from 12-5 p.m. 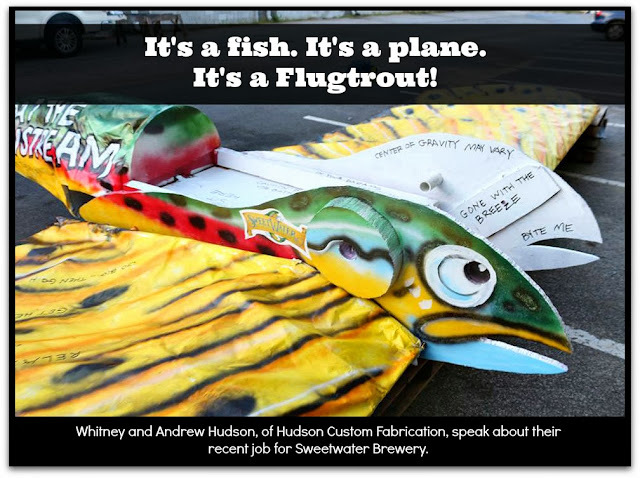 The fabricators behind the job, Andrew and Whitney Hudson of Hudson Custom Fabrication (self-described beer aficionados both) happily agreed to build the flying fish for one of Atlanta’s oldest craft breweries. They took some time out from running their small business and running after their three daughters to answer a few questions about the job and what makes their business unique. To vote for Team Sweetwater, the brewery suggests you "click the big red VOTE button a time or 10, or text MIA13 to 72855. The rules say we can't bribe ya, but we'll send you some serious good karma if you help us out." You can also follow the event on Facebook, and cheer them on through social media @redbullMIA, hashtag #flugtag. The Flugtrout assembled and waiting for it's final touches. Images courtesy Hudson Custom Fabrication. Used with permission. HB: So, can you tell us a little bit about your most recent project? I’d actually never heard of Flugtrout before you started posting pictures of it. Was it new to you as well, and can you tell us about the event itself for those that aren’t familiar? HCF: We had heard of the Flugtag event previously and had seen video footage of ridiculous flying contraptions plummeting to their watery demise, so when Sweetwater contacted us we were super excited to work on it. HB: Is this a typical project for you? What kinds of work do you usually get? Are your clients mostly Atlanta-based? HCF: This was a very unusual project for us as it was riveted together based on a Georgia Tech aerospace engineering student’s design and is, well, a flying fish. We typically do architectural and ornamental metal fabrication, a main example of which is fabricating stainless steel cable railings. That being said, we revel in tackling one-of-a-kind projects (hence the word “custom” in our company name), and have made things like a bicycle rack for a motorcycle and a liquid nitrogen frozen margarita maker. We love a good challenge. HB: It seemed pretty involved from the pictures you posted on Facebook. Was it a tough job? HCF: It was very involved and took a total of 120 hours between two men to make the parts and ensure everything fit together properly. It is very light and weighs only 50 lbs in spite of its 26 foot wingspan and 20 foot length. I think the main challenges had to do with keeping it lightweight while making sure it was sturdy enough to support a 99 lb pilot. As with many projects we handle, what can be drawn on paper doesn’t always work in reality so we had to make adjustments to the design as we put it together. HB: Can you divulge some of the details surrounding how you got the job? Had you done work for Sweetwater before and did they pay you with beer? HCF: A friend of ours follows Sweetwater on Twitter and apparently they asked for recommendations for someone who could make this for them. We had not worked for them previously and were happy to get a foot in the door with another brewery. Like everyone, we have expenses so we can’t accept beer alone as payment but we were quite willing to take them up on a free round after a hard day of work. HB: I know you helped a mutual friend of ours, Will Avery, build out his home brew rig (although he’s since sold it having made the move to working in a brewhouse full-time). 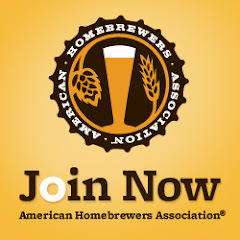 Have you helped other homebrewers with their setup, or are you looking to add more work like this to your portfolio? 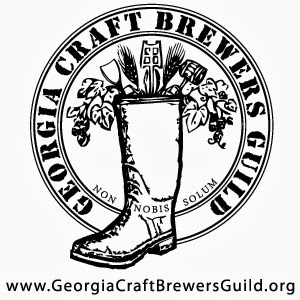 HCF: We previously helped a manager at Terrapin brewery with his homebrew rig and are quite willing to do the same for others. Will is a wonderful brewer and we like to think our work had a small part in his move to brewmaster at Burnt Hickory. It would be fantastic to help others similarly. HCF: Our skill, attention to detail, knowledge and professionalism gives us a (sharp) edge over our competition. There aren’t many in our area who know how to deliver beautiful metal projects as well as punctual, courteous service. HB: Anything else you’d like to talk about? 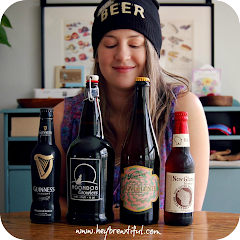 HCF: If any of you local brewers have projects you’d like us to work on, feel free to entice us to a meeting over a couple of your beers and we’ll discuss!